Brian Orland, UGA’s Rado Family Foundation/UGAF Professor of Geodesign in the College of Environment and Design, is coordinating an initiative composed of more than 90 institutions worldwide designed to share design ideas on how to improve global infrastructure. The International Geodesign Collaboration has a coordinating group comprised of researchers and practitioners at UGA, the University of Minnesota, University College London, Harvard University, the Environmental Systems Research Institute and GeoDesignHub, an international problem-solving technology platform based in Dublin, Ireland. One goal of IGC is to bring together projects addressing challenges of changing geography across the planet and enable designers and planners to learn from the experiences of their contemporaries in other geographical, governmental and institutional settings. Geodesign, according to Orland, is a design approach that uses digital mapping and inventory to help communities assess and shape their futures in ways that incorporate the systems that sustain them-a shared process that is the embodiment of systems thinking. Geodesign becomes the tool kit through mapping and spatial analytics. Digital maps are created to help people make critical decisions about everything from predicting flash floods, to cutting disease outbreaks and helping small coastal communities face the challenges of rising sea levels. People and communities across the globe are facing similar problems: Why not share resources and creativity in addressing them? It is no accident that UGA created the first professorship of this kind anywhere in the world. Bruce Rado and Lawrie Jordan, 1970s alumni of UGA, both went on to Harvard where they studied with Carl Steinitz, one of the major early proponents of systems overlay design using computer-generated imagery. Rado and Jordan subsequently founded ERDAS, a pioneering world leader in creating software for analysis and use of satellite imagery. Jack Dangermond, a colleague of Rado and Jordan’s at Harvard, was founder with his wife, Laura, of the Environmental Systems Research Institute, in Redlands, California. ESRI is the global market-leading geographic information system software company. Today, this constellation of colleagues is at the forefront of innovation in how people understand and address the planet’s changing character. 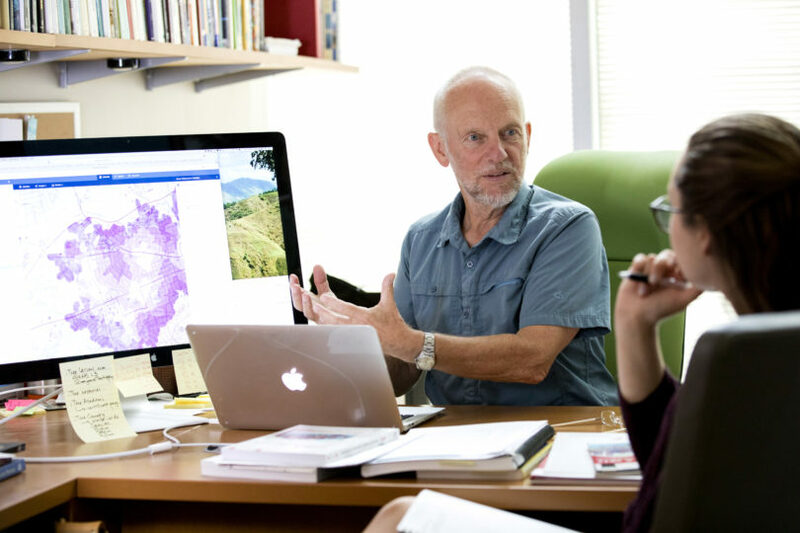 Using mapping and spatial analytics, digital maps are created to help people make critical decisions about everything from predicting flash floods to cutting disease outbreaks and helping small coastal communities face the challenges of rising sea levels. The convergence of these tools in a framework for deliberate design at geographic scale resulted in the coining of the term “geodesign.” Ten years later, ESRI continues to host an annual geodesign ­summit to celebrate and recognize advances in this new field. Two years ago, at the Geodesign Summit, Orland and Steinitz, with the University of Minnesota’s Tom Fisher, realized that numerous practitioners and academics were engaged in innovative geodesign projects and wanted to learn from each other but needed a format or framework with a common language that would make it possible to compare a project in Saudi Arabia to one in Hong Kong or coastal Georgia. The IGC emerged from that discussion. Using a common framework developed by Steinitz, Orland and Fisher, 90 universities in 34 countries have completed projects in 37 countries. Each design project portrays discrete patterns of land-use change in a unified format, projecting planning needs for the next 15 to 35 years and taking into account projected global changes, such as climate, habitat and population changes. This month, another gathering will take place in Redlands, California, to commence the process of gleaning points of contrast and commonality from the completed projects. Topics they will explore include: Which landscape change systems received the most attention, or the least? How are the U.N. Sustainable Development Goals addressed by design solutions? Does scale play a dominant role in the choice of design approach? Do interdisciplinary teams produce better design proposals? UGA will be represented by CED faculty, including Rosanna Rivero, Alison Smith and Alfie Vick. They will make presentations about work done by them and their students. UGA’s project focuses on increasing Georgia’s coastal resilience as this rapidly developing area develops the infrastructure to sustain lives and livelihoods in the face of sea-level rise, increased storm severity and diminishing fresh water resources.